Wayne Hunt has pastored Coteau Baptist Church in Houma, Louisiana, since 2007. 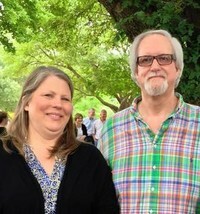 He is originally from Georgia, and is a graduate of the New Orleans Baptist Theological Seminary. Wayne has a heart to see people have a growing relationship with Jesus. During his time at Coteau, the church has seen close to 300 salvations. Wayne has a heart for missions. In November of 2011, he went with a team to Jamaica. In 6 days, the team saw over 1100 professions of faith in Christ. Wayne has a heart for ministry, ministering to residents of Terrebonne and Lafourche Parishes. While at CBC, this church has ministered to people through three hurricanes. In 2008, Coteau Baptist Church received a key to the city and parish for their work during Hurricane Gustav. Wayne has a heart for people. Wayne currently serves as a chaplain for a local fire department and is a disaster relief team leader and chaplain. In 2015 Pastor Wayne became a certified trainer for the Federation of Fire Chapalins International. Wayne has a heart for growth. Coteau Baptist has grown, purchased property, and renovated several areas of the facility, all the while meeting or exceeding their budget requirements every year during a trying economy. Wayne and Anita married in June of 1983. They have two daughters who both have graduated college and are serving the Lord in various capacities in Baton Rouge. Elizabeth aka Lizzy accepted her call to ministry in middle school after experiencing her first missions trip to Grand Isle, LA. Like many young people, the experience changed her life but upon returning home to Kentucky she fell in love with serving others and sharing the Gospel. Matthew 28:18-20, known as the Great Commission, spoke measures in to her life. She surrendered to missions and the journey began. God continued to grow Lizzy as a teenager and young woman, leading her to study religion both in college and graduate school, making it possible to obtain her B.A. Religion and M.Div. with a focus in public health. In June 2010, Lizzy married her husband Jude and they moved to Atlanta, GA. It was then that Lizzy answered the call into youth ministry while serving alongside her husband. Three years later, Jude accepted a job in oil industry and Lizzy found herself living in the bayou. Patiently, waiting to see what God would bring her to next on the journey. Almost a year after the move down south, Lizzy came on staff here at Coteau. In 2017, God blessed Jude and Lizzy with their first child, Tobias (Toby). All of them, including their furbaby Jack, reside here in Houma living, serving and loving as God would have it here in the bayou. God continues to enlarge Jude and Lizzy's mission field. To God be the glory!